What have Posekim decided regarding families that were torn apart as a result of the Holocaust, particularly with respect to marriages where the husband was taken and never seen again (but not confirmed dead by any witnesses)? Are there any Teshuvoth indicating what to do and how to treat the status of women who subsequently remarried, especially those that went on to have children (and the status of those children)? Is there any consideration for the mass murder and chaos of the Holocaust, which may have made it impossible to know definitively if a husband of a certain wife was actually killed before she had children with her new husband? Is any distinction made between cases in which women remarried with the permission of a Beith Din and those who did not? Even though it's an old question, still I would like to answer it, as my native country was heavily involved in this very sad historical event. 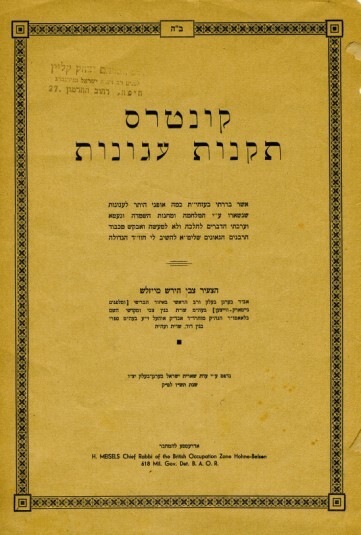 One of the most important work on the issue is the essay of R' Tzvi Hirsch Meisels זצ"ל of Vác (Waitzen), who wrote in 1946 Kuntres Takanot Agunot right in the Bergen Belsen DP camp after the liberation (see original cover here). Another leading figure of this effort was R' Chaim Mordechai Roller זצ"ל from Romania, who eventually went to Budapest to set up a special beit din (בית דין מיוחד לתקנות עגונות) at the local orthodox community and he was consulted by many other rabbis. Unfortunately he died in 1946, but this beit din continued to work under the direction of R' Yaakov Lebovits זצ"ל from Nagykapos with R' Yisrael Welcz זצ"ל and other members. * Based on accounts, they issued thousands of permissions for agunot, many can be found on the internet. Among many rabbis who exerted huge efforts, R' Shelomo David Kahane זצ"ל should be also mentioned, who had a separate office in Jerusalem for freeing agunot. Regarding the halakhic point of view, the situation was different for a male and a female missing spouse. Ashkenazi males were banned from poligamy by Rabbeinu Gershom, while women would have been considered adulterers should the disappeared husband turn up. Therefore all the minute details were asked from the surviving witnesses to make decisions. The Budapest beit din created printed forms, where they would ask information about the deportation, to which side the missing spouse was sent on the ramp or if someone saw her/him to work or eventually die. If absolutely no information was available for missing husbands, they seeked technical reasons to invalidate the ketubah. In case of men, usually a new marriage was allowed, and if the disappeared wife showed up, he needed to divorce her with a proper get (Igrot Moshe Vol 7. on Even haEzer 'ס' ב). The most famous person, who didn't use this leniency, was R' Yekutiel Yehudah Halberstam, the Klausenburger rebbe, who asked the approval of hundred rabbis (היתר מאה רבנים) to divorce his wife, since she couldn't accept her get. See also this very good article on the issue by Esther Farbstein. * R' Lebovits (1896–1980), the author of the Mishnat Yaakov, emigrated later to Williamsburg (see one of his letters here), while R' Welcz (1887–1973) was the author of Chok leYisrael and went to Jerusalem. Not the answer you're looking for? Browse other questions tagged sources-mekorot mamzer holocaust-shoah responsa aguna . Is the holocaust divine punishment for the wrongs Jews have done?